The SEC keeps threatening to go after ICOs because most offer profit sharing and voting rights similar to what stock equity owners receive. But pure utility cryptocurrency tokens—where you have the right to a discounted, priority buy of a new product or service—do not have equity features or face security regulation risks. The problem is that these utility tokens may not have much price increase upside potential—and thus not get much sales. The key is to look for opportunities where a utility token can have big price increases. The utility token offered by Fortitude Ranch may be the ideal ICO for investment. It starts with a discounted purchase price from current rates for an established, proven business. The price of this new token will surge periodically as demand for this company’s service exceeds capacity since token holders get priority to buy when a wait list forms. Since it is a potentially lifesaving service, people desperate to get the protection Fortitude Ranch offers may bid the token price to very high levels. I’m the CEO of Fortitude Ranch (FR), a retired USAF Reserve Colonel and intelligence officer, with a Masters Degree and PhD from Harvard University. I served in the Institute for Defense Analysis, the top DoD think tank, and in the Senior Executive Service in the Pentagon. A former Vice President at Securities America, I’m currently Managing Director of Blockchain Business Consultants and CEO of FR. I’m a Certified Management Accountant, Certified Mergers & Acquisitions Advisor, and Certified Financial Planner. I’ve published articles and spoken at national conferences on major threats we face today including bioengineered viral pandemics. FR is a large survival community equipped to survive any type of disaster and long-term loss of law and order, managed by full time staff. FR is affordable because of large numbers of members and economies of scale. FR is especially attractive to join because it doubles as a recreation/vacation facility as well as a survival retreat. Members can vacation, hunt, fish and recreate at FR’s forest and mountain locations in good times, and shelter at FR to survive a collapse. Our token sale is an advance sale of FR memberships to fund expansion from two existing facilities to a dozen sites across the United States, and an international location. The cryptocurrency token, called a Fortitude, gives you a discount price on Fortitude Ranch membership, protection from membership price increases, and priority in joining FR when waitlists occur. During a major crisis or media reports on developing threats, demand for membership in FR will surge beyond our capacity, and the price of Fortitudes will likely spike since those desperate to get in will need Fortitudes to have first place in line. A startup has to first develop the application, then get users to adopt it, then grow the program to sufficient scale to generate profit. The odds of success for this are pretty low. Fortitude Ranch, already an operating business, doing an advance sale of membership tokens to expand, poses much less risk. We are “coining” the term “Initial MemberCoin Token,” IMO, rather than ICO, to emphasize that this is a utility token with no profit share or equity features that invite securities regulation problems. IMO Advisors include Charlie Shrem, a bitcoin pioneer and COO of Jaxx digital wallet, James Barry, a former IBM executive and blockchain expert, and Larry Hall, the CEO of Survival Condo, the most successful survival services company. Unlike most ICOs for startup software development projects with low odds of success, FR is an established, market tested, proven company. There is no R&D or business development spending, just building out existing WV and CO sites, and expanding to new locations across the U.S. and overseas. Little downside in the token’s value because it is an advance purchase of membership at a 25% discounted price (+20% discount if purchased in first 24 hours of the IMO), and prices likely to go up. Because of the priority right to join we designed into the Fortitude, it has huge upside potential. 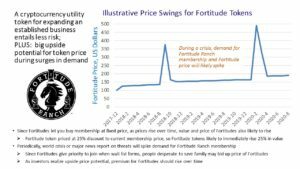 The Fortitude price will periodically surge as there are alarming crises, well publicized warnings, and developing threats that lead more people to determine they need our service. FR is an anti-fragile business—in a disaster that will tank the stock market, demand for our services and the price of Fortitudes will surge. Details on the company and IMO, including videos and White Paper, are available at www.fortituderanch.com.